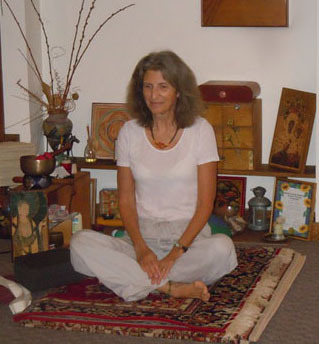 KATE BERG received her yoga teacher training from Yoga Acharya Sarabess Forster. Kate's teaching style is in the Sivanada Yoga tradition which combines meditation, deep relaxation, and pranayama (breathing) with yoga asanas (physical yoga positions). She is also a certified pilates mat instructor. She has taught yoga at Montgomery General and Holy Cross Hospitals, the National Institutes of Health Clinical Center, and Fitness First. She now gives classes in her own Quiet Willow Studio in Silver Spring, Maryland. She instructs yoga for all levels, ages, and physical conditions, and has interest and experience in teaching people with special needs. Kate has a Ph.D. in genetics and did research at the National Institutes of Health for many years. She has been writing professionally for over 20 years. Much of her writing has appeared in peer reviewed scientific journals. However, she has also published articles for lay audiences and edited newsletters for patient groups. In addition to yoga and pilates, Kate makes and sells fabric art including quilts, jewelry, and "re-purposed" Barbie dolls. She is married to John Berg. They have three children, two dogs, two cats, and a beautiful garden.